We have seen that the social situation is a very strong determinant of whether or not we help. But although the effects of personality may not generally be as strong as those of the social context, person variables do matter. Some people are indeed more helpful than others across a variety of situations, and we say that these people have an altruistic or prosocial personality (Penner, Fritzsche, Craiger, & Freifeld, 1995). To see how you stand on this variable read the statements in Figure 8.4.1, “Measuring the Altruistic Personality,” and consider the extent to which you agree with them. Figure 8.4.1 Measuring the Altruistic Personality. This scale measures individual differences in willingness to provide help—the prosocial personality. 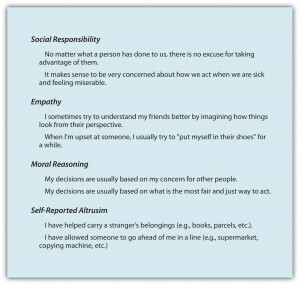 The scale includes questions on four dimensions of altruism. Adapted from Penner, Fritzsche, Craiger, and Freifeld (1995). In terms of their attitudes toward the reduction in funding, there were no significant gender differences. Men thought that the funding should be maintained even when the disease only affected women, and vice versa. However, as you can see in Figure 8.4.2, “Effects of Standing on Feelings of Comfort in Taking Action,” when asked how comfortable they would feel attending a meeting protesting the funding decreases, significant differences occurred. The men predicted that they would feel less comfortable attending a meeting to protest the funding reductions when the disease only affected women, and the women predicted that they would feel less comfortable attending a meeting to protest the funding reductions when the disease only affected men. Figure 8.4.2 Effects of Standing on Feelings of Comfort in Taking Action. This figure represents participants’ ratings of how comfortable they would be attending a meeting supporting the attempt to prevent funding reductions for a disease. Suggesting that a norm of self-interest is necessary to get involved, both men and women were less likely to feel comfortable arguing for a position that does not influence them personally. Data from Ratner and Miller (2001, Experiment 3). First, we need to remember that not all helping is based on other-concern—self-concern is also important. People help in part because it makes them feel good, and therefore anything that we can do to increase the benefits of helping and to decrease the costs of helping would be useful. Consider, for instance, the research of Mark Snyder, who has extensively studied the people who volunteer to help other people who are suffering from AIDS (Snyder & Omoto, 2004; Snyder, Omoto, & Lindsay, 2004). To help understand which volunteers were most likely to continue to volunteer over time, Snyder and his colleagues (Omoto & Snyder, 1995) asked the AIDS volunteers to indicate why they volunteered. 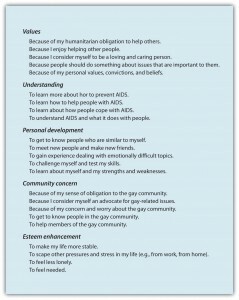 As you can see in Figure 8.4.3, “Reasons for Volunteering to Help AIDS Victims,” the researchers found that the people indicated that they volunteered for many different reasons, and these reasons fit well with our assumptions about human nature—they involve both self-concern as well as other-concern. Figure 8.4.3 Reasons for Volunteering to Help AIDS Victims. From Omoto and Snyder (1995).